2 Some animals are really fast. Cheetahs can run up to 70 miles per hour. But some animals are really slow. Sloths are the slowest mammals in the world. They do everything very slowly! There are two species of sloths; two-toed sloths and three-toed sloths. These animals live in the rainforests of South and Central America. Most of their time is spent hanging upside down in trees. It can take a sloth one whole day to move from one tree to the next. That's s-l-o-w! 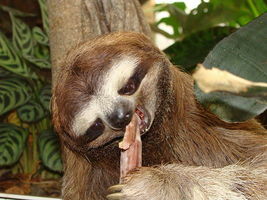 3 Sloths eat slowly too. These mammals are omnivores. They usually eat leaves and twigs. Sometimes, they will eat bugs or lizards as well. It can take a sloth an entire month to digest its food. That's really s-l-o-w!